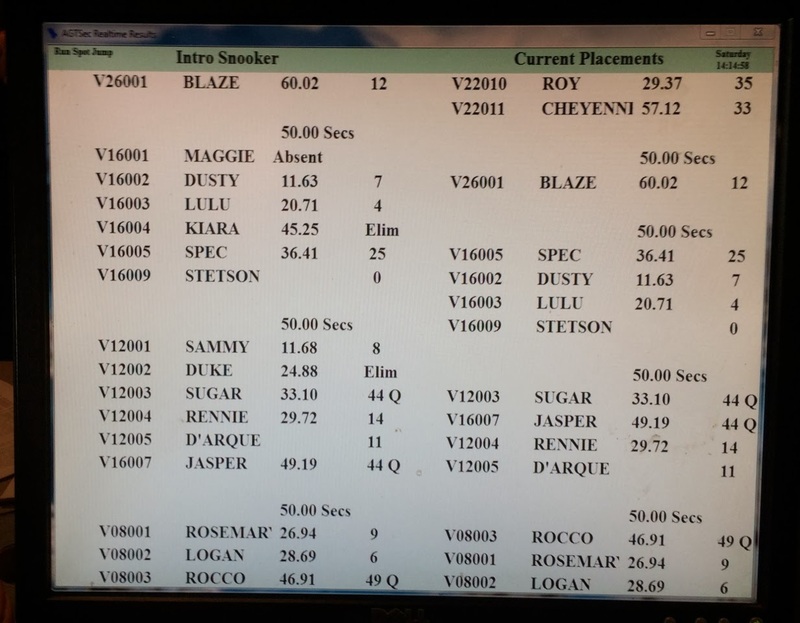 Rocco snagged two firsts and two thirds, not too shabby for a baby dog! 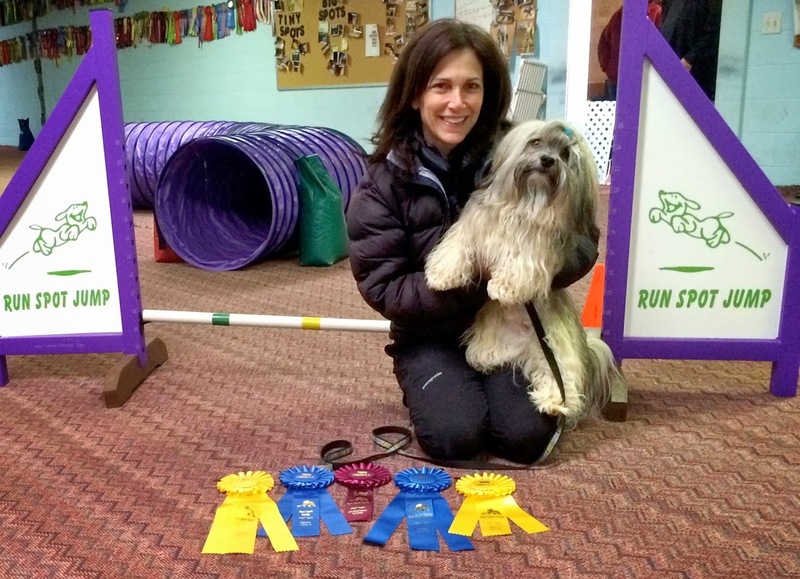 Rocco and I recently competed in our first USDAA Intro Agility Trial at Run Spot Jump in Canton, Ga. This is a great opportunity for beginner dogs and beginner handlers to get a little trial experience in a smaller and more relaxed setting than a regular trial. The USDAA introduced the Intro Program in 2011 so these events weren't around when I first started trialing with Cosmo. And I've got to tell you, this was a terrific experience and a great way to ease a young pup into a trial setting. If you are about to start agility trailing, I highly recommend looking for an Intro Trial in your area. The trial is smaller. With fewer dogs entered, the experience is less overwhelming for your pup. You can enter your dog when he's 14 months old vs. 18 months at a USDAA trial. Classes offered include Standard, Gamblers, Jumpers and Snooker. I really didn't know how Rocco would perform in this type of setting so I looked at it as a good learning experience. We worked through a few unexpected issues in the beginning -- Rocco was a bit alarmed by the ring crew person sitting still as a zombie in the corner of the room. But we worked through that and Rocco had a great day, taking home two firsts, two thirds, including a first-place qualifying run in Snooker. Snooker is a terrific game and one of our favorite agility events. It's a game of strategy, speed and accuracy where you are trying to accumulate points by taking certain obstacles in a limited amount of time. You're able to devise your own course in the opening segment, but must take the three jumps marked by red flags before following each jump with an obstacle of your choice. Each obstacle is given a point value so the strategy is to take as many high value obstacles in the opening as you can to accumulate the most points. Then, you go to the closing segment and take it in the number in which it is marked from #2 through #7. We chose to take two teeters for maximum points in the opening and then race across the course to take our final red jump and an obstacle before heading to the close. Sound confusing? It is at first, but it's not nearly as complicated as these rules make it seem! Take a look at our first-place qualifying Snooker run. It can be quite hilarious as you run past LOTS of obstacles to go for the highest value obstacle for maximum points! Rocco and I had a blast and can't wait until we enter our first grown-up dog agility trial, hopefully later this spring! Last week we wrapped up the winter edition of K9Kamp and thanks to all who participated in Kamp and our great giveaway! Congrats to Kelly T., our giveaway winner! That looks like fun! I love tunnels best! Looks like you had fun and roll on Spring. Have a fabulous Friday. I hadn't heard of that program before but it sounds like a great idea. Does it still count for points? You can title in it, but I don't think the qualifying scores carry over to regular USDAA events. Wow, way to go! I hadn't known about the intro program before your post, thanks for the info! Look at all those ribbons! Congratulations!! Rocco is a flying fluffball! Good work! That's the way it was when I started with Cosmo too. He went nuts and got the zoomies for about the first year we trialed! I've learned a lot more since then, AND this intro trial was a great start since it was inside and the amount of stimulation seemed more controlled. Can't wait to see how he does outside! Awesome! You look great with all the ribbons and you make agility look real easy! It's funny how it looks so easy when everything goes right! But it doesn't feel nearly as easy as it looks! Great job Rocco. (You too Diane). What a fun way to stay fit. Way to go! Great job to both of you! Snookers looks fun! =) We look forward to seeing more of your runs and your adventures in Agility together. How fun! I'm so glad that you and Rocco had so much fun and so much success! Maybe one day Barley and I will look into this, but for now we still need to practice just being in high energy situations with other dogs nearby. Congratulations! That looked like so much fun!! Rocco did great!